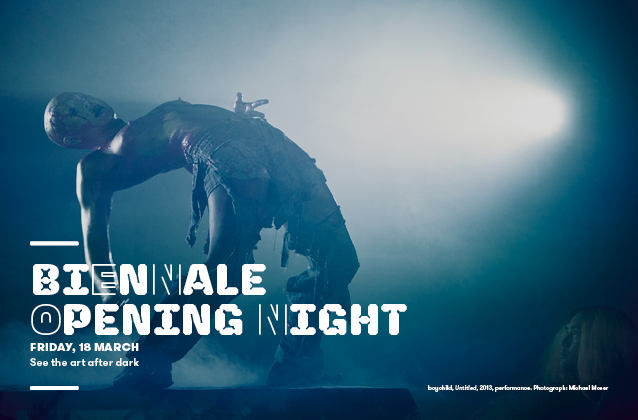 Biennale Opening Night: the must have ticket in March. Presented on Friday,18 March on Cockatoo Island, Biennale Opening Night offers the unique opportunity to view the art after dark, with ambitious installations and amazing artworks lit for one night only. Guests will also be treated to a performance by boychild, a persona birthed in San Fran’s queer drag scene. 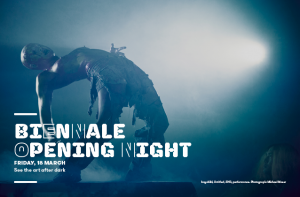 Using artist Korakrit Arunanondchai’s denim-clad installation as a stage, boychild will recast her body as a cyborg, recording a dynamic, live visual and sound performance accompanied by a percussive score. Limited tickets available for $35 per person: ticket price inclusive of private ferry transport to and from Cockatoo Island. Please note: your ferry departure time will be emailed to you in advance of the event.